There are several locations on your IDX pages where your visitors will encounter a Sign-Up form. You can customize the fields in your lead sign-up form, including adding new fields, rearranging them and specifying which are required. Click Leads in the main menu, and Lead Registration Preferences in the submenu. Click the toggle toward the top left of this screen to Advanced, and then click on the Sign-Up Page tab. On this screen the first two sections are related to spam prevention; Block all Lead Submissions originating outside North America and Captcha. You can read more about these and other spam prevention techniques in this article. In the section labeled Current Sign Up Form Preview, you will see a preview of the fields currently displaying on your lead sign-up form. 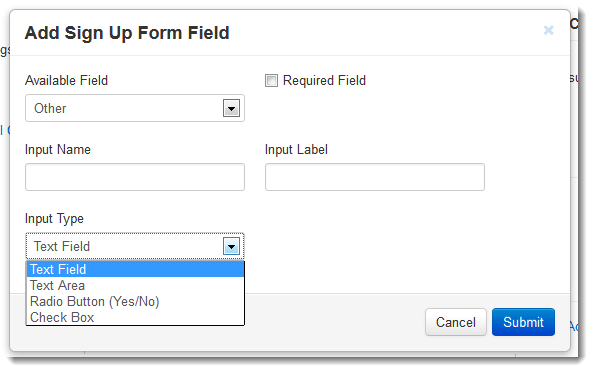 Using this preview, you can rearrange, add, or remove fields on the form. 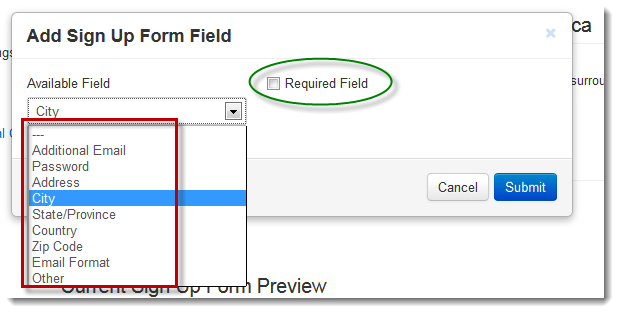 To re-order the fields on the form, simply click on the Drag Point icon to the left of the field name and drag and drop them into your desired order. You can add fields into your Lead Sign-Up form by clicking on the "Add More Fields" link to the right of your form preview. A new popup will appear where you can select the type of new field you would like. For most types the only extra customization available is whether or not you would like to make this field "Required" for successful submission of the form. The Other field offers you more options for creating a new custom field. Input Name - Choose an internal designation for your new field. Input Label - This is the label that will display on your actual website form. Input Type - Choose the field format. You can choose between text, text area, check boxes, or radio buttons. Text: A single line-height box in which text can be typed. Text Area: A taller box in which it is easier to type a longer message. Radio Button: A button in which only one option can be selected, "Yes" or "No". Check Box: A single option that can be selected or deselected by the client. Remove fields by clicking on the Trash icon next to the field you want to remove. Some fields cannot be removed as they are essential for the correct capture of the Lead into IDX Broker. You can also choose to use Captcha on your sign-up form by clicking Yes in the Captcha section on this page. The Captcha form will display below the rest of your form fields. 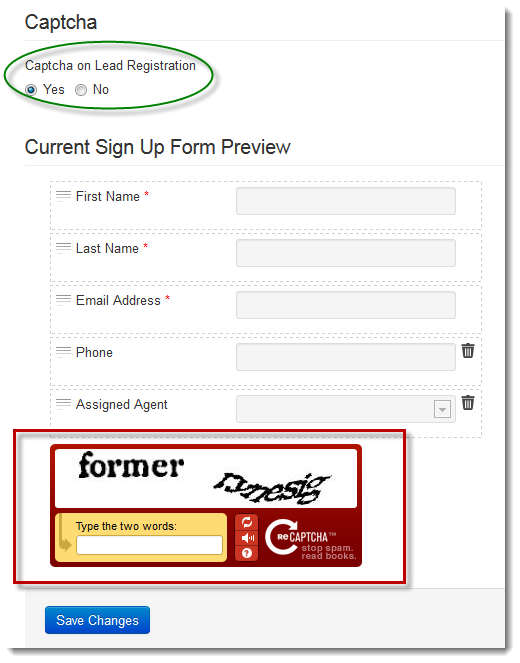 When you are finished with all of your lead sign-up form customizations, click Save Changes at the bottom of the screen. To see your changes in action, just view your IDX sign-up page on your website.